30 December, 2013. It was a Monday. Please note that I am using a laptop with Windows 8.1 as the operating system. But the following setup should also work without any modifications on Windows 7 & 8. Karma will now monitor all the files we have declared in the config file and run the tests if any of those files changes. When starting up Karma starts up an instance of the browser(s) we defined in the configuration file. The browser listens at the port also defined in the configuration file. We do not need to observe the browser instance any further and can minimize (not close!) it, since it won’t show any test results. All test results will be shown in the console window where we started Karma. Since we do not yet have any files containing tests Karma will report an error that no matching files were found. But we also know that we have correctly configured our system and we are now ready to write our first tests. 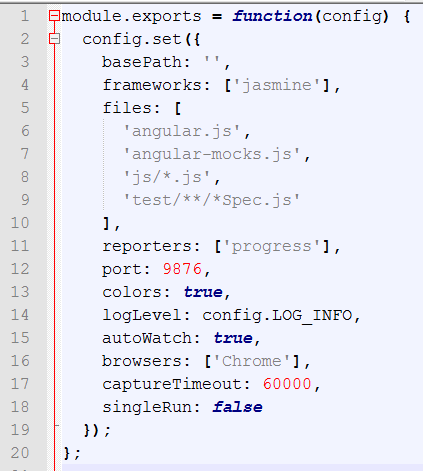 First we copy the two files angular.js and angular-mocks.js into our application directory. Then we create a new subfolder js and add a file sample.js to this new folder. Using e.g. 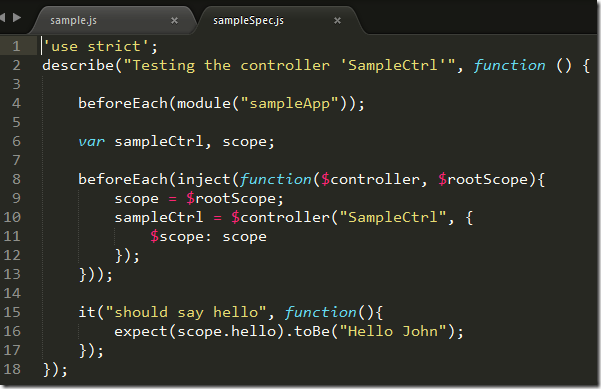 Sublime we define a simple controller called SampleCtrl which does nothing else than initialize a property hello on the $scope of the controller. This is the controller we want to write a test against. Create a new directory test and add a file sampleSpec.js to this directory. This file will contain our tests that we write using Jasmine. Please refer to the Jasmine documentation for details about the syntax. This roughly corresponds to a test class in C#. We provide a description of the scenario as the first parameter of the describe function and a function containing all our test arrangements, the test act and the test assertions (AAA = arrange, act, assert) as second parameter. 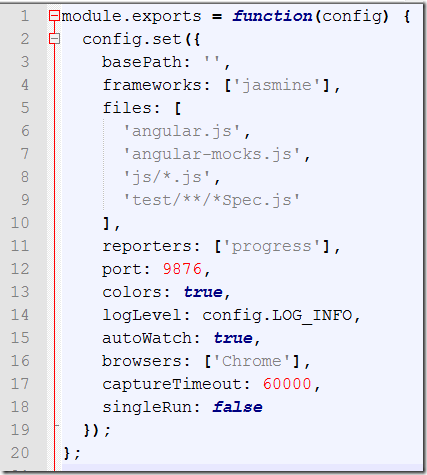 Where we use the module function provided by angular-mocks.js. 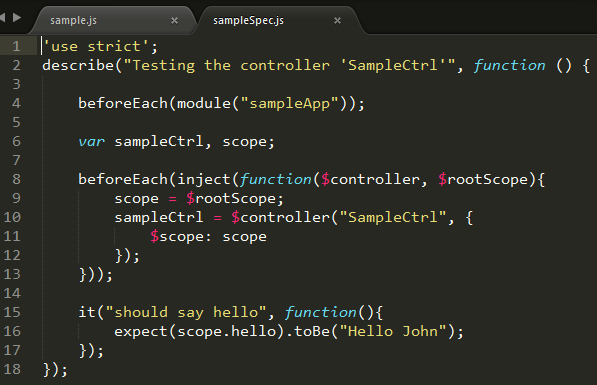 Here we use the inject function defined in angular-mocks.js to provide us the $controller and the $rootScope service via injection. We then use the $rootScope as our scope and use the $controller service to get an instance of the SampleCtrl controller. The second parameter of the $controller service call is the parameters that get injected into the controller. In this case it is only one parameter – the $scope – which we provide here. Having configured everything we are now ready to write our first assertion. For this we can use the it function provided by Jasmine. Yes, I’m aware, this was not TDD what I demonstrated so far since I first wrote the code and then the test. But this post was mainly about getting our system setup correctly and ready to start TDD. In this post I have show how to setup our system to be able to write unit tests for an AngularJS application. We are using Jasmine as the test framework and Karma as the test runner. A crucial step in the whole setup is to author the correct configuration file for Karma.